SUNY College at Buffalo recently installed a Yamaha AFC (Active Field Control) system in its 200-seat Ciminelli Recital Hall. 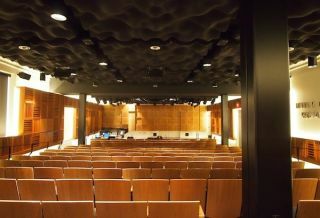 The recital hall, located within Rockwell Hall, has been designed to accommodate small ensemble and solo performances by students of the Music Department and research in multi-channel sound diffusion. Rockwell Hall is one of four of the original buildings encompassing Buffalo State and houses the departments of music and art conservation as well as an 850-seat performing arts center. The Buffalo State Music Department also offers a minor in Digital Music Production with a track in Electronic Music Composition and a track in Sound Recording. This program also features a Digital Music Ensemble that uses state-of-the-art electronic instruments. The growing popularity of the minor is steering the department into offering a major and a Master’s degree in Music Technology. “The Ciminelli Hall with its 52.1 surround system is a great addition to the department’s facilities, one which will attract students nationwide,” added Henriques. AVL Design of Penfield, NY designed the initial system with installation assistance from subcontractor AV Solutions (Rochester, NY). Boynton Pro Audio of Norwich, NY provided the system components. Joe Rimstidt of Yamaha Commercial Audio Systems, Inc. and engineers from Yamaha Japan completed the final AFC design, and with assistance from colleague Steve Seable, completed system tuning in late August. Brian Wittmer, head of the College’s facilities department, functioned as project manager. The AFC3 system designed specifically for the Ciminelli Recital Hall includes four permanent microphones, 38 speakers plus 2 subwoofers. Some of the speakers serve multiple purposes, being AFC speakers when in AFC mode, and being part of the hall’s 7.1 Surround system when in that mode. The original design included four AFC2 processors, but after the release of AFC3, the school opted to upgrade two of the AFC units to AFC3. In total, there are five AFC units, five IPA8200 amplifiers, three Dante cards, and one AD8HR mic preamp. The school was very interested in being able to route signals to individual speakers for their electronic music program so the Dante cards were added to the AFC units to allow them to route signals that would be mixed with the AFC signals and output to any of the individual AFC speakers they may select. The complete system includes both an early reflection system and reverberation enhancement system. The two systems are intertwined so the 20 audience speakers can receive a mix of the ER and REV signals. On the stage/ performance area, there are six speakers on the sidewalls that receive ER signals only and 12 speakers overhead for the reverberation enhancement. Several Yamaha DME (Digital Mixing Engine) units equipped with various MY cards facilitate an extensively flexible routing system enabling signal routing from various consoles or computers to the recording studio, the AFC speakers, or any of the speakers in the house surround system.